Duval Street in Key West is the main hub of activity on our tiny island. Duval Street stretches from the Atlantic Ocean to the Gulf of Mexico and there is a wide variety of bars, restaurants, vacation homes, art galleries, local shops and coffee shops in between. Indulge yourself in our Key West nightlife and be just a short walk away from your tropical oasis. 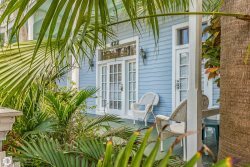 Key West Hideaways has many of our nightly and monthly rentals near or on Duval Street.